Dive in to the ultimate tale of shipwreck and survival in this illustrated, finely crafted keepsake edition of the classic adventure story that has thrilled readers for nearly three centuries. 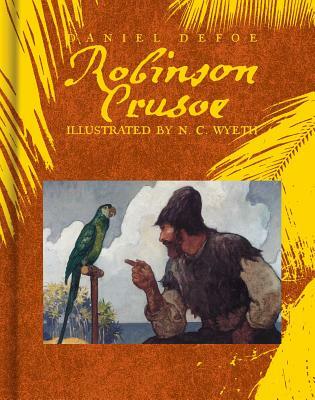 After a fierce storm at sea, Robinson Crusoe is marooned on an uncharted island, with only a few bits of his wrecked ship’s flotsam and jetsam to sustain him. For more than two decades, he faces the wrath of nature and the struggle to stay alive with little more than his wits to save him. Then, following an encounter with cannibals, a tribesman named Friday becomes Crusoe’s only ally. As their relationship develops, the line between servant and friend begins to blur, and the possibility of freedom for them both at last looms on the horizon. This collectible edition of a beloved adventure includes a soft-touch cover, gold foiling, and luminous illustrations from N.C. Wyeth, whose oil paintings perfectly depict the roiling seas, baking sun, and vast expanse of open space. Daniel Defoe (1659–1661) was an English writer and journalist most widely known for his novel Robinson Crusoe, originally published in 1719. His work varied from political pamphlets to poetry, and included other novels such as Religious Courtship and The Political History of the Devil. He lived in London, England.